Hello, ghosts and ghouls! Are you ready for some truly scary cross stitch patterns? Don't be afraid! They won't hurt you...much. These patterns have been lurking in the shadows, hiding in the dark corners of the internet, just waiting for you to stitch them up. Can you do it? Turn down the lights, sit back and stitch. Enjoy some spooky stitching fun! Want to tell those pesky trick or treaters that all the candy is gone? Why not hang a note on the door to let them know to move along. 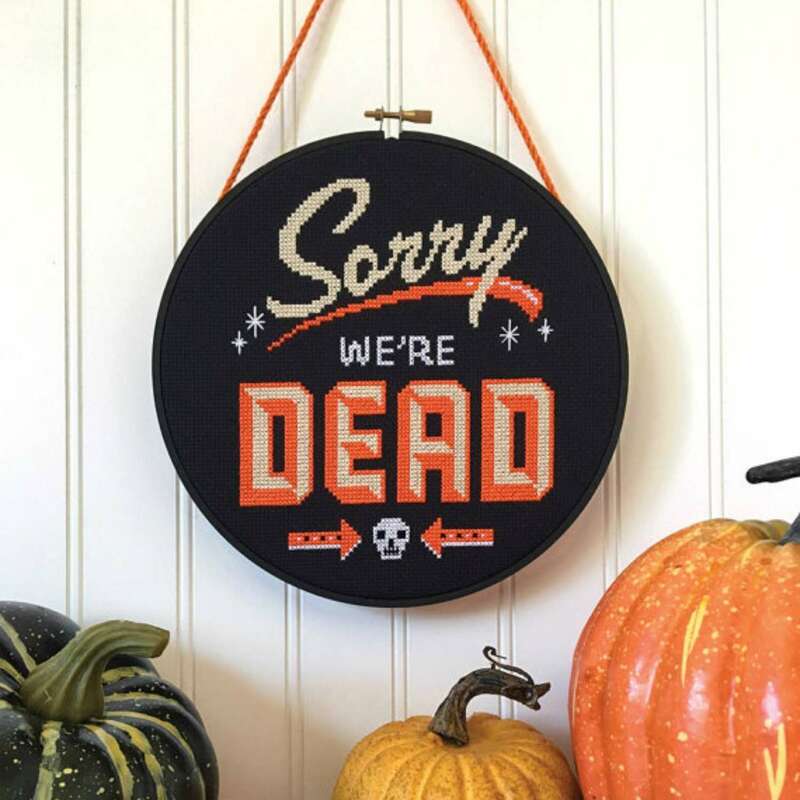 This Sorry, We're Dead pattern from Satsuma Street is a cheeky way to celebrate the season and avoid people in the process. The pattern is available for instant download. It is a quick stitch and if you are not into the black, you can switch out the fabric for a different effect. Will you have little monsters ringing your doorbell this Halloween? Don't be afraid of those little goblins; just make sure you have the good kind of candy; full-sized chocolate bars, suckers, and gummies. Things monsters do not like: toothbrushes and raisins. This pattern by Bella Stitchery Designs shows off the cuter side of monsters. This project would be adorable on the front door or on a trick or treat bag. How do you feel about staying the night in a haunted bed and breakfast? You can share your pancakes with the ghost and goblins in the hotel. Maybe hanging out with the undead isn't your thing, but you can still stitch up a haunting pattern from The Eflin Forest. This pattern of a Halloween Bed and Breakfast is so inviting and cute. If you are still too spooked to stay, just stitch it up instead! The Elfin Forest has so many Halloween patterns from whimsical to primitive. Time to set sails and join your spooky friends on the seven seas. Instead of canvas, your sails are ghosts. They will guide you on your voyage of doom! You can have tea with Davy Jones and stitch the time away with Blackbeard. There have been tales that Mr. Blackbeard is the king of the French knot. Bats are amazing creatures. They take care of the creepy crawly bug population for us. They get such bad press for being scary, but in reality, they are pretty awesome creatures. Take for example Batacula by Fox, You are So Crafty. This little guy spreads his wings to show off his quilt inspired beauty. The colors in the pattern are very subtle. While it can be stitch up at Halloween, you can leave it up all year long. Your home is your castle unless it is being overtaken by ghosts. The last people who owned your house refused to leave. They want their bedroom back! If you live in a haunted house or have a friend or family that lives in one, this pattern is a perfect addition. It lets visitors know exactly what they are in for when they stay the night. Maybe you aren't a people person, well then, stitch this up and keep everyone away. This project would look spooky on the mantel or the front door. This pattern by Time for Stitch is just one of the Halloween themed projects they have in their store. The patterns range from scary (like the one here) to cute, to more traditional. Prairie Schooler may have retired but their patterns are as popular as ever. Their primitive Halloween patterns are some of the most sought after out there. This pattern, Knock Knock, is no exception. The little trick or treater going up to the door with ghosts swarming around is somewhat haunting. You feel a little nervous for the little one. "Don't ring the doorbell," you scream. You want her to be safe. Just keep stitching, it will be okay...for the ghosts. Want to see a hot debate? Ask people whether or not they like candy corn. Some absolutely love it, while others think it is the candy of the devil. This candy corn dress cross stitch pattern is a fun take on the famous Halloween treat. Create a wonderful centerpiece with this project and your favorite fall candy. Cross stitch designer Nora Corbett is well known for her beautiful and haunting fairies and witches. Her pattern for Electra is ready for Halloween with her orange and black gown and pumpkin accessories. These patterns are very detailed but are great for beginners due to the easy to follow directions. Can you imagine the witchy fairy leaping off the fabric and mixing up a sinful brew? Lots of interesting things happen at the stroke of midnight. Some people believe that it is the witching hour. Ghostly spirits, witches and their familiars will gather around the full moon to dance, cast spells and have Halloween fun. The Primitive Hare is well known for her Halloween primitive inspired patterns. From Sleepy Hollow to sleepy ravens, she offers a wide range of patterns with a vintage feel. This raven enjoying himself by the moon is just one example. 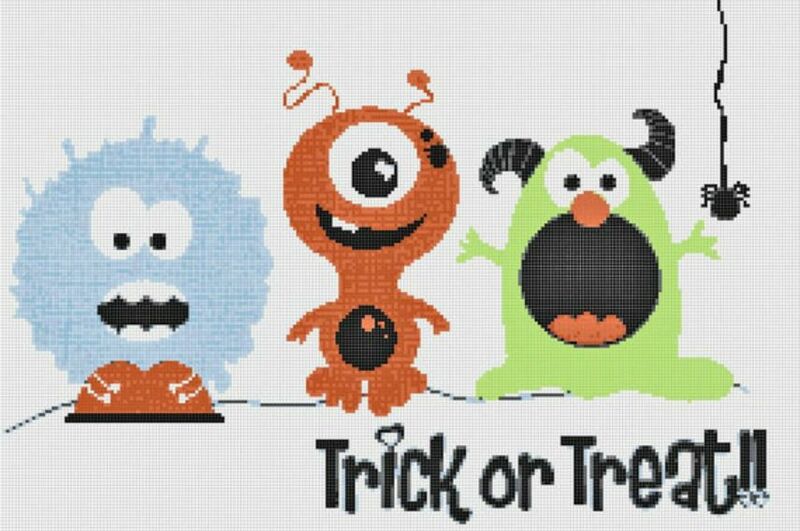 No need to be scared of these Halloween cross stitch patterns. They are the perfect addition for this time of year. From cute to scary, ghost and monster projects can be stitched any time. Every day is Halloween with these ghoulish cross stitch decor. Don't forget, WATCH OUT BEHIND YOU!